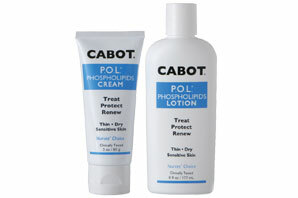 Tina, RN, talks about treating her severely dry skin with P.O.L. CREAM. P.O.L. CREAM is formulated to deliver the proven benefits of phospholipids – powerful natural antioxidants and the chief moisturizing agent in the skin which cover the skin to provide long lasting moisturizing and protection – to provide safe and gentle natural treatment and protection for aging skin. Phospholipids are the prime building blocks of all forms of life – and thus phospholipids are indispensable to all forms of life and healthy skin: assembling and strengthening skin cell membranes, stimulating microcirculation and accelerating the natural healing of the skin. The key to healthy skin: moisture and antioxidants. The less moisture that skin has, the more vulnerable it is. The super-moisturizing formula of P.O.L. CREAM is steroid-free and antihistamine-free, so you can use it as often as needed. This proprietary formula protects, hydrates, and helps skin to heal itself to create a healthy moisture balance to relieve scaly, flaking, cracked, severely dry skin and reduce the visible signs of aging. Recent studies suggest that regular/daily use of P.O.L® CREAM, which incorporates Cooplerlabs’ proprietary, patent-pending complex of phospholipids, glycolipids, and ceramides rebuilds skin tissue and may prevent or even reverse many problems associated with thin, dry, aging skin.